Yeah, it’s about time I updated this thing. -First, overnight Friday into Saturday, Adirondack struck a trade with Orlando, sending rookie forward J.C. Campagna to the Solar Bears for forward Andrew Radjenovic. Radjenovic, a 26-year-old Ontario native, is in his second ECHL season, and already on his third team. He started the year with Cincinnati, appearing in 10 games and scoring twice, before being acquired by Orlando and not dressing for any games. He has prior ECHL experience with Bakersfield in 2014-15, with 8 points in 22 games. Campagna had appeared in 12 games for the Thunder before the trade, with 3 goals and 6 assists. He already has two assists in 2 games so far for the Solar Bears. -Earlier today, the first non-Binghamton/Syracuse AHL callup, as forward Brian Ward was signed to a PTO with Utica. This is Ward’s third AHL team in three seasons, having previously appeared in one game for Charlotte in 2015-16 and 8 games for Albany in 2016-17. Ward is one of six Adirondack skaters to appear in all 17 games so far. In those 17 games, he has 5 goals and 6 assists. The calm before the Thunder in Glens Falls. Well…I made it through my first weekend post-Albany hockey. But anyway…let’s review how things went around the state as the AHL got underway for real, and the ECHL preseason got started. Sunday, the Thunder traveled to Pennsylvania looking to rebound from Friday’s loss. The Royals would again jump ahead early, as Adam Schmidt scored his third of the weekend for a 1-0 lead. Reading would double the lead midway through the second on a K.J. Tiefenwerth goal. But the Thunder would cut the lead in half with another power play goal, this time off the stick of Desmond Bergin. The Royals would seal the 3-1 win late in the third with a Matt Wilkins goal. Nick Riopel drew the starting assignment for the Thunder, stopping 23 of 26 shots. Roster-wise, Adirondack received a third player from Tampa/Syracuse, as forward Troy Bourke was reassigned to the Thunder after appearing in the Crunch’s 3-2 overtime loss to Rochester on Saturday. On Monday, the Thunder acquired defenseman Nick Trecapelli from Brampton for future considerations. He is about to begin his second pro season after playing collegiately for the University of Guelph. In a combined 41 games with Wichita and Atlanta last season, Trecapelli had 4 goals and 10 assists. He does have some AHL experience, appearing in 7 games with the Binghamton Senators in 2015-16, going scoreless. Also, three players were released from their tryouts: Jack Ceglarski, Evan Neugold, and Mark Petaccio. The Thunder will kick off the regular season on Saturday night at home against Brampton, my designated Game of the Week for this week. Pregame ceremonies had a mix of everything…all players suited up escorted a local veteran onto the ice and lined up along the blue line, a hilarious lipsynced opening video (after last year’s collection what else would you expect? ), then finally the division and conference championship banners were raised to the rafters of the War Memorial. The Crunch and Amerks were finishing off an opening weekend home and home series, which started with a 3-1 Rochester win on Friday night. In Saturday’s rematch, the Amerks were first on the board with the first shot ever faced by Crunch rookie goaltender Connor Ingram, a power play goal by C.J. Smith 10:33 into the first. Cory Conacher would tie it up just under six minutes later with his first goal of the season. Early in the second, Kyle Criscuolo would score his first to put Rochester back up by 1. The lead would remain until 8:09 of the third, when Kevin Lynch’s first goal would tie the game up at 2. The game would get to overtime, but it didn’t last very long…Kevin Porter would score 39 seconds after puck drop, giving Rochester the weekend sweep and dropping the Crunch to 0-1-1-0 to start the year. Former Crunch goaltender Adam Wilcox picked up the win in net, stopping 24 of 26 shots. Ingram stopped 15 of 18 Amerk shots, and even had a tripping penalty to boot. Rochester has only one game on the schedule this week, hosting the Comets on Friday. Syracuse has a 3 in 3 weekend: they host Belleville on Friday and Utica on Saturday, then head down Interstate 81 on Sunday for a matchup with Wilkes-Barre/Scranton. In the Southern Tier, it was a successful beginning to the Devils new life, as Binghamton defeated Bridgeport 2-1 on Saturday. And All About the Jersey was there to cover it all. I must say, my successors (Jeff and Alicia) are doing amazing work…happy to see I left things in good hands! The B-Devils will head north to Laval this weekend for a pair of games against the Rocket. Utica started a month long road trip in Toronto, and dropped both games to the Marlies, 3-1 on Saturday and 4-3 on Sunday. Reid Boucher lead all Comet skaters with 3 points on the weekend. Utica will head west on the Thruway this weekend: Rochester on Friday, Syracuse on Saturday. Big…and surprising news…from the Mohawk Valley this afternoon. New York Governor Andrew Cuomo visited Griffiss AFB in Rome for a pair of announcements for the city of Utica: first, an additional $10.5 million dollars in state funds will go towards more renovations for the newly named Adirondack Bank Center at the Utica Memorial Auditorium, on top of the 7 million already tied into the current project. Second, the AHL announced that the 2018 All Star Classic will be returning to Utica for the second time in four years, taking place January 28th and 29th between the Adirondack Bank Center and Turning Stone Resort & Casino, who again will be the main sponsor. For those that wonder why the Comets got the All Star events back so quickly…well, it’s based on city interest in hosting the event, which includes having adequate hotel and meeting center space, among other things. My first All Star event was in Utica back in 2015, and I must say the Comets did an amazing job. I’m definitely looking forward to making my fourth straight All Star trip! Meanwhile, in the Southern Tier, the next chapter of Binghamton hockey began with the opening of Devils camp. Four Thunder signees–Tim Boyle, Pierre-Luc Mercier, Tim Harrison, and the newly signed Desmond Bergin–are invites, along with defenseman Tim Erixon (recently cut by New Jersey) and veteran forward Tim Kennedy, who split last season between Sweden and Rochester. -The Crunch have invited veteran forward Jason Akeson to camp on a tryout, and also signed former Thunder forward Ty Loney and winger Troy Bourke to AHL contracts. Thunder signee Terrence Wallin is in camp on an invite as well. -Utica received the services of former Devil Reid Boucher, who cleared waivers earlier in the day. -Also in Utica: The Aud is getting an updated name as part of their renovations, The Adirondack Bank Center at the Utica Memorial Auditorium. 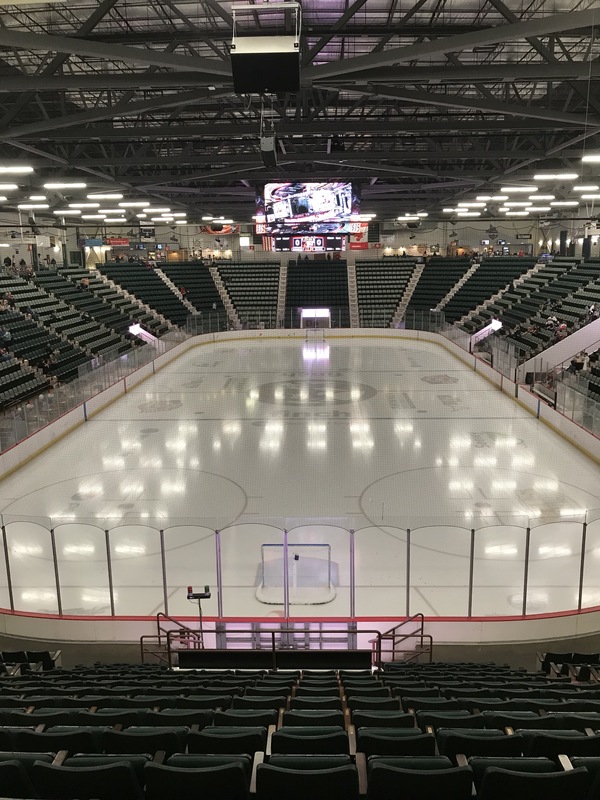 The first event after renovations are completed will be Utica College’s home opener in late October, with the Comets to follow on November 1st. -Ben Thomson, Scott Wedgewood, and Bracken Kearns were placed on–and later cleared–waivers, while Mackenzie Blackwood, Brandon Baddock, Nathan Bastian, Brandon Gignac, Ryan Kujawinski, Blake Pietila, Kevin Rooney, Blake Speers, Yaroslav Dyblenko, Josh Jacobs, Michael Kapla, and Colton White are en route to the Southern Tier. First day of camp will be on Thursday, with game action 24 hours later against the Penguins, who start their preseason against Hershey at home tonight. Rooney was recalled to New Jersey on Wednesday, and is in the lineup on the 4th line as the parent Devils face Washington in their final preseason tuneup. AHL camps are opening for business! I always looked forward to when New Jersey–and Carolina too–would make their first round of cuts. That meant it was almost time for my hockey season to truly begin. Sigh…but not this time around. Anyway…the show goes on for the rest of the league. To Syracuse: Connor Ingram, Michael Leighton, Mat Bodie, Matt Spencer, Alex Gallant, Carter Verhaeghe, Kevin Lynch, Reid McNeill, Shane Conacher. Jamie McBain is currently on waivers and will join this group once he clears tomorrow at noon. To Rochester: Eric Cornel, Vaclav Karabacek, Steve Moses, Kevin Porter, Brycen Martin, Casey Nelson, Devante Stephens, Jason Kasdorf, Jonas Johansson, Adam Wilcox, Kyle Criscuolo, Hudson Fasching, C.J. Smith, Brendan Guhle. To Utica: Michael Carcone, Yan-Pavel Laplante, Evan McEneny, Zack MacEwen, Griffen Molino, Ashton Sautner, Jordan Subban, Alexis D’Aoust, Aaron Irving, Brett McKenzie, Carter Bancks, Wacey Hamilton, Jaime Sifers, Danny Moynihan, Anton Cederholm, Mackenze Stewart. New Jersey has yet to make any assignments to Binghamton. The Devils will have two split squad games on Monday, in Brooklyn against the Islanders and in PEI for the Kraft Hockeyville matchup with Ottawa. Syracuse kicks off their camp on Tuesday afternoon at the War Memorial. The Crunch will start their preseason slate on Saturday afternoon in Rome against Utica, then host the Comets on Sunday, October 1st. Rochester will start their camp Monday afternoon at the Blue Cross Arena. They will take on Toronto Friday night at RIT, followed by a rematch on Saturday at HarborCenter in Buffalo. Utica’s camp will begin this week (no dates available at press time), with the home and home series against Syracuse their only two preseason games scheduled. No official information on when Binghamton’s camp will open is available. They too have two preseason tilts, a home and home series with Wilkes-Barre/Scranton starting Friday in Pennsylvania, then finishing Sunday afternoon in the Southern Tier. On Friday, the Thunder acquired the rights to defenseman Desmond Bergin from Quad City for the ever popular future considerations. Bergin will be starting his second professional season after spending all of last year with Greenville. In 60 games, the native of Natick, MA scored 7 goals and assisted on 19 others. He was traded by the Swamp Rabbits to Quad City for Jack Nevins on August 14th. Before turning pro, he played collegiately at Harvard and spent one season in the USHL. How about some links for your Sunday as NHL training camps get rolling? Finally, my first opportunity to put together an actual AHL post! Other News: On Saturday, the logo was officially revealed and…you be the judge. Let’s just say I’m a bigger fan of the sleeve patches and leave it at that. Otherwise, it’s been a fairly quiet offseason, outside of Nicomania hitting the Garden State. Other News: It’s been a summer of change in western New York, as a new regime takes over in Buffalo–new GM (Randy Sexton), new coaching staff (Chris Taylor and Gord Dineen take over behind the bench), and quite a few veteran signings by the Amerks/Sabres with the aim of helping Rochester get back to being competitive again. Other News: Just a summer of reloading for the defending Eastern Conference champs, as the Lightning have done a great job of not only re-signing key members of last year’s Crunch team, but bringing in a netminder of Michael Leighton’s caliber. 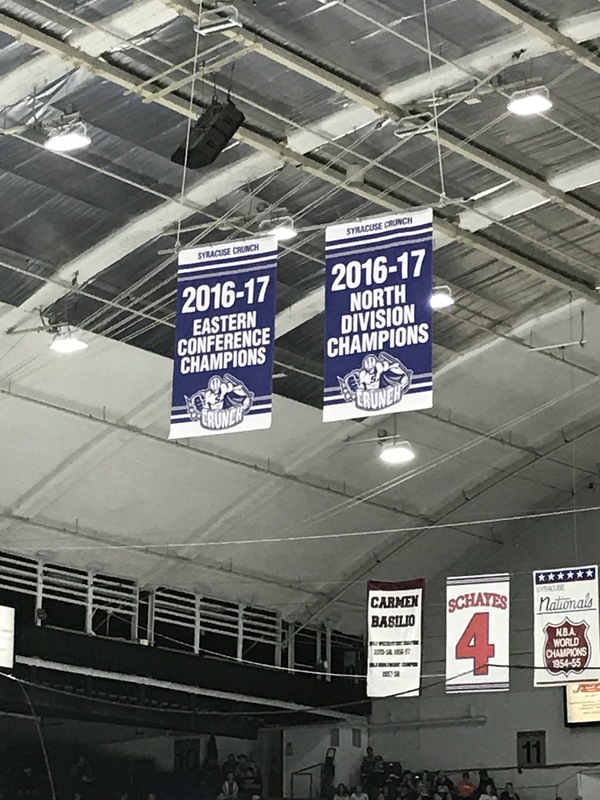 Other News: It’s the fifth season of the AHL return to Utica, and other than the renovation of the Aud, it’s been a rather quiet summer for the Comets to this point player-wise. Behind the bench, former Crunch coaches Trent Cull and Gary Agnew take over for the promoted Travis Green and Nolan Baumgartner (now with Vancouver), and Ryan Johnson was brought in as the new general manager.